A postcard sent from the trenches in World War One has just been delivered - 90 years late. 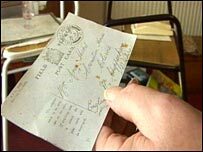 Soldier Walter Butler was 18 and fighting in the trenches in France when he sent the card to his fiancee Amy Hicks, in Colerne, Wiltshire. The postcard, which is dated 1917, has only just been delivered to his 86-year-old daughter Joyce Hulbert. It was discovered in the Swindon sorting office, but no-one is sure what happened to it. "Yes I was surprised, but I've had more surprises than that in my life - I'm 86," said Mrs Hulbert. Joyce's husband Arthur said: "It was a surprise, quite interesting really. The poor chap suffered out there in those trenches - they couldn't send a letter out because of security really."